I heard from yet another author today who was woefully disappointed in the money he recently wasted hiring a book marketing/PR firm. I’m looking to hire (insert name of book marketing/PR firm here) for (hundreds or thousands of dollars). They have promised to promote my book through social media, print and mail cards to bookstores, send out a press release to (hundreds or thousands) of media by email, send me promotional products (personalized pens, stickers, placards, coffee mugs, bookmarks, key-chains, etc.).. Do you think it’ll be worth the cost? The author I mentioned above recently hired a PR firm that claims to do marketing and promotion for children’s book authors. The firm charges anywhere from $275 to (gulp!) $7000+ for a variety of services ranging from putting a free copy of your ebook online (which can actually HURT sales, and is something you can easily do yourself anyway) to media outreach programs (ahem…likely spamming the same email list of journalists over and over again), to social media campaigns (which sound plausible up front but it’s possible the marketing/PR firm has purchased fake “friends” and “followers” to make their lists appear more impressive than they really are). Self-published authors with money to burn (literally) are ripe for the picking by firms like these. If, after hearing my advice, an author disagrees with me (unfortunately, some authors insist on learning the hard way), and really wants to throw their money away in this manner, I encourage them to first ask the marketing/PR firm specifically which similar books they have promoted in the past, how much the author paid, and how many book sales resulted from their efforts. Also, I advise them to ask how many books they’ve promoted in the past, and what percentage of those authors got a return on their investment. The marketing/PR firm will often cite privacy when refusing to answer the question. That’s a red flag right there. But, you can go one step further to jump over their heads. Many of these firms have (alleged) success stories posted to their websites. With a little search engine detective work, it won’t take long for you to find the authors of some of those books online. Contact them through their websites and ask them if their marketing campaign resulted in enough book sales to warrant the up-front fees they paid that marketing/PR firm. Also, don’t forget to research the reputation of the firm, using the firm’s name along with words like scam, complaint, and rip off. I have never hired any firm or individual to promote my books. Instead, I use the steps described in 90+ DAYS OF PROMOTING YOUR BOOK ONLINE: Your Book’s Daily Marketing Plan. And, my books keep selling, year and after year. No coffee mugs, keychains, or worthless press releases required! If you want to find someone to help you with book promotion, I recommend hiring a personal book publicist, someone who will truly work with you on a one-on-one basis, who will truly care about your book’s success, and who isn’t getting kickbacks (oops…I mean “commissions”) from their boss when up-selling you on more and more worthless services. If you do hire a personal book publicist, ask them the same questions I mentioned above before signing a contract and, of course, before sending them any money. 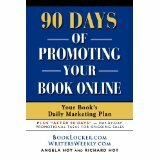 If you’re swamped, and don’t have time to do your own promotion, or if you simply don’t like the idea of doing your own promotion, you might want to consider hiring a college student or freelance “personal assistant” to help you with the daily tasks outlined in 90+ DAYS OF PROMOTING YOUR BOOK ONLINE: Your Book’s Daily Marketing Plan. POSTSCRIPT: Always, ALWAYS avoid doing business with firms that spam you. If a marketing/PR firm must resort to spamming to get new clients, they do NOT know what they’re doing. Don’t trust spammers with promoting your book! BOOK MARKETING E-SERIAL PART 1 – Your Book Is Ready to Sell…But DON’T Make This Common Mistake! Read more columns by Angela RIGHT HERE. One Response to "BOOK MARKETING AND PR FIRMS – WORTH THE HIGH COST?? Probably Not! Here’s why…"